A charming and significant story set prior to the Civil Rights Movement about a boy who finds a way to challenge segregation laws. Frank has always been obsessed with elephants. He loves their hosepipe trunks, tree stump feet, and swish-swish tails. So when Miss Fancy, the elephant, retires from the circus and moves two blocks from his house to Avondale Park, he's over the moon! Frank really wants to pet her. But Avondale Park is just for white people, so Frank is not allowed to see Miss Fancy. Frank is heartbroken but he doesn't give up: instead he makes a plan! Frank writes to the City Council so his church can host a picnic in the park, and he can finally meet Miss Fancy. All of his neighbors sign the letter, but when some protest, the picnic is cancelled and Frank is heartbroken all over again. 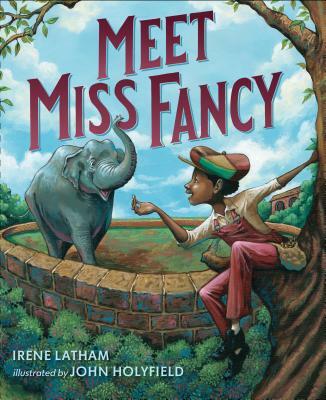 Then Miss Fancy escapes the zoo, and it's up to Frank to find her before she gets hurt. Irene Latham is the author of more than a dozen current and forthcoming books, including two novels for children: Leaving Gee's Bend and Don't Feed the Boy. Winner of the 2016 ILA Lee Bennett Hopkins Promising Poet Award, her poetry books for children include Dear Wandering Wildebeest, When the Sun Shines on Antarctica, Fresh Delicious and Can I Touch Your Hair? (co-written with Charles Waters). Irene lives in Birmingham, Alabama with her family where she does her best to "live her poem" every single day by laughing, playing the cello, and walking in the woods. A renowned fine artist, John Holyfield lives in Fairfax Station, Virgina.